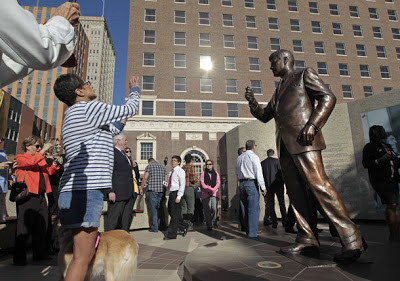 Among the hundreds of people who gathered Thursday for the dedication of the JFK Tribute in downtown Fort Worth was a woman who, with four other housewives, led a drive 48 years ago to get the city to honor the slain president. Dale Parrent, the only surviving member of "The Kennedy Ladies," as they were known then, had in her pocket a small piece of paper with the names of the other four women who worked with her: Gerry Cornelius, Pat Aguirre, Pauline Martinez and Charlene Bridges. "I wanted them here with me," Parrent said while waiting for the ceremonies to begin in General Worth Square, the site where Kennedy spoke Nov. 22, 1963, to thousands of Fort Worth residents who had gathered in the rain outside the hotel where he spent his last night. The first idea the women had was to have the parking lot where the president spoke turned into a park or plaza named for him, but the City Council rejected that notion. The site later was dedicated in honor of the man for whom the city is named, frontier U.S. Army Gen. William Jenkins Worth..
Because Tarrant County voters had approved bonds for a new 16-block convention center across the street from the parking lot, the women presented county commissioners with a petition bearing 10,000 names calling for the new center to be named for Kennedy, but commissioners refused. They were later persuaded to name the theater in the convention center for the president who had made his last two speeches in Fort Worth. The president's name, however, never was placed on the outside of the building. In 1999, the City Council, which had taken over ownership of the convention center from the county, voted to tear down the theater to make way for expansion of the outdated facility. With that demolition, went the city's only tribute to the late president -- until Thursday's dedication of an exhibit honoring Kennedy's life and his visit to Fort Worth, rather than memorializing his tragic death. And while the new JFK Tribute is a work of art unto itself, the exhibit has brought new life to the previously underused General Worth Square. In preparation for installation of the Tribute, the city spent $250,000 on improvements to the square, including adding lighting, to make it more people-friendly even at night. A five-piece limestone sculpture installed on the site in 1999 was removed to the Fort Worth Community Arts Center. General Worth Square is now a more attractive and inviting public space that will draw local residents and out-of-town visitors to the historic spot. The JFK Tribute adds purpose and context, providing not only a learning experience, but a place for quiet reflection. The block between the Hilton Fort Worth (in 1963, the Hotel Texas) and the Fort Worth Convention Center can now be described as beautiful, and it may provide incentive for owners of some of the neighboring properties to do some sprucing up of their own. As for Parrent and the other "Kennedy Ladies," they might in a way get part of their original wish. Because the JFK Tribute now dominates General Worth Square, the site of the old parking lot might become known more for its history with Kennedy than Worth.